The magnetic ID Badge Holder is easy to use. The 2-part holder includes one sticky back foam pad that you stick to the back or your ID or badge holder. Peel the covering from the tape and attach it to your name badge, business card, or anything else you want to attach to your clothing without puncturing holes. 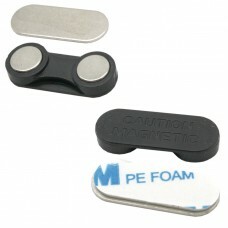 Two round rare earth Neodymium button magnets in plastic with zinc-plated steel plate. Steel plate includes a pressure-sensitive adhesive 3M foam pad with peel-away liner. 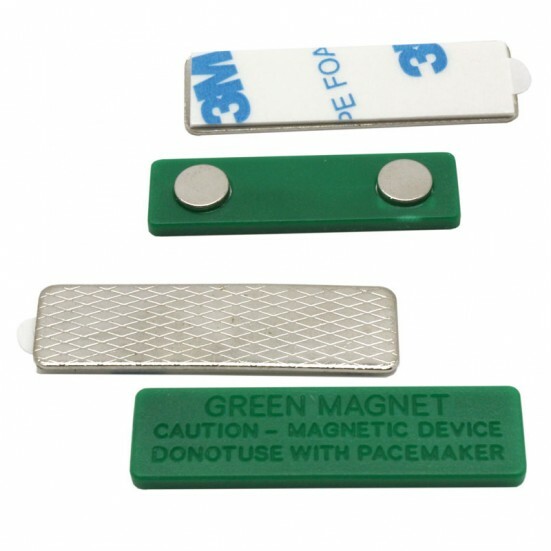 The magnetic ID Badge Holder is easy to use. The 2-part holder includes one sticky back foam pad tha..